At Foster Dogs, our vision is simple: we want to be the bridge to create a positive and inclusive foster community. To achieve that goal, we have several programs in place to help dogs in need find the people who want to help them. Foster Dogs designed a one-of-a-kind online database of active foster caretakers in the NYC area that allows us to efficiently and effectively match dogs in need with appropriate foster homes. This program is offered for free to any approved participating shelter or foster-based rescue organizations. Join the Foster Roster. Foster Dogs has developed a stellar education program that we offer for no charge to our foster community! 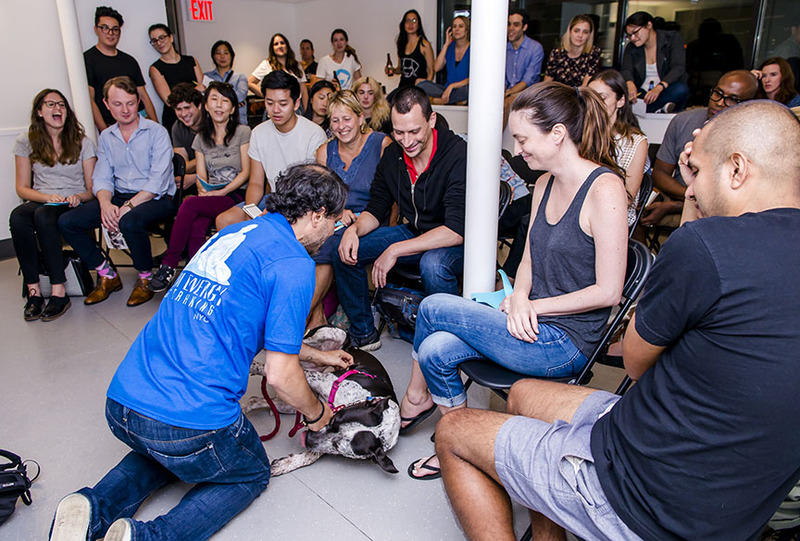 Offered in convenient Manhattan locations, our workshops are designed for anyone interested in fostering or improving their lifesaving expertise. See upcoming events. This program, developed jointly by Foster Dogs & Susie’s Senior Dogs, connects celebrities and influencers with fantastic adoptable dogs. "Famous Fosters" participants use their platforms to help promote fostering and adoption, sharing their first-hand experiences to prove that many typical barriers to fostering can be easily overcome. This incredibly heartwarming program assists elderly or terminally ill shelter dogs in finding “forever foster” placements. Foster Dogs supports both the dog and our dedicated Fospice fosters throughout their journey, providing the dogs with much needed vet care, love, and dignity during their final months together. Foster Dogs believes that fostering should be free! Our Lending Library is hosted at the BARK headquarters in Manhattan, and offers useful dog care supplies at no cost to our Participating Organizations. Need supplies to distribute to your foster volunteers? Request items for your shelter! Puppy Parties are a wonderful and innovative way to reward or motivate your team! Our volunteer staff is experienced in delivering the most professional and adorable event you can imagine. Your team will be covered in puppies as they learn about our mission to expand the wonderfully positive experiences of fostering and adopting. Request a Puppy Party!